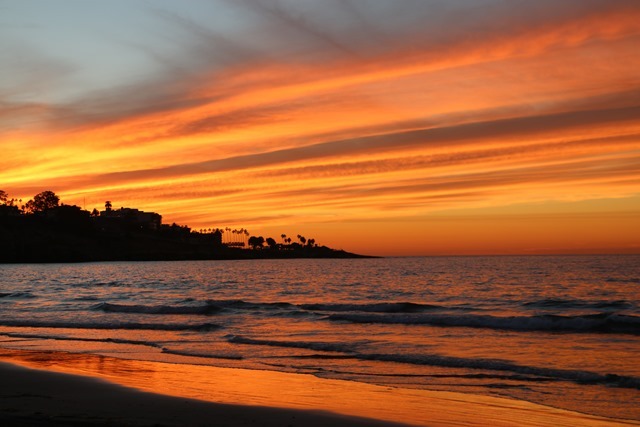 Today was a day of comebacks from the brink of defeat, overwhelming victories and in the end a gorgeous sunset. The weather was California Tourist Bureau perfect, with a few clouds in the afternoon so the sun wasn’t in the players’ eyes. I played Mariko Atoji in the morning. We started about 8am. Mariko and I practice a lot and so there were no surprises. She started well and ran me around the court, hitting big forehands and keeping her backhand in the court and even attacking with swing volleys. She won the first set and though we had some good points, went up 4-0 in the second. At that point I decided to just try and prolong the points, to keep fighting and to try and get a game or two. I won three games with this strategy, then she got the 4th to go up 5-3. I won the next three games and she again won the 4th, so it was tiebreaker time. She went up 4-1 and then I won the last 6 points. I got ready for a third set but Mariko retired with cramps. I did see her stretching out but she kept running pretty well the whole match. The first 2 sets lasted nearly three hours! 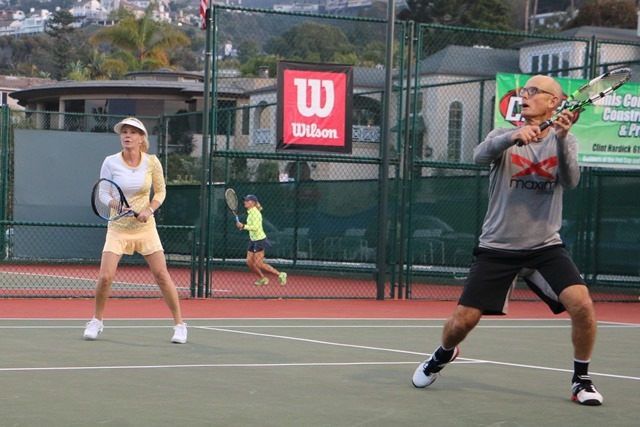 An hour after the singles Una Davis and I played doubles against a good team. We were blown out in the first set 61, then changed things up some in the 2nd and there were no breaks of serve. We both had set points in the tiebreak before they won their second match point, taking the tiebreak 9-7. I have the day off tomorrow and am going to watch the women’s singles and doubles finals, since I didn’t get to see much tennis today. In the women’s semis, Dina McBride easily beat a tired Fanny Gamble 61 60, (the blowout), in contrast to the Jennifer Dawson/Amy Frazier marathon. 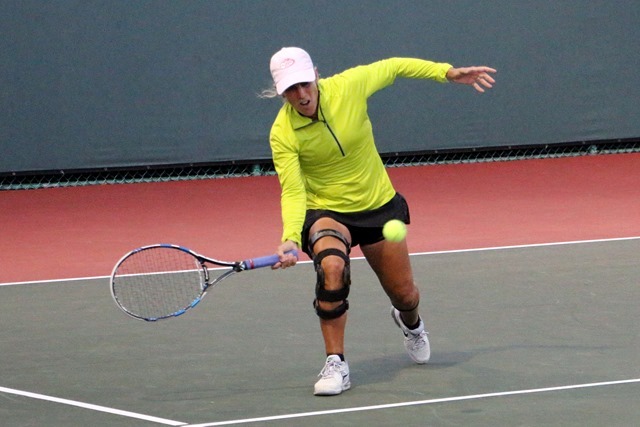 Amy won the first set 64 and was up 41 in the second when Jennifer rallied (comeback) to take the set 64. In the third Frazier won the final four games to win the set 62. 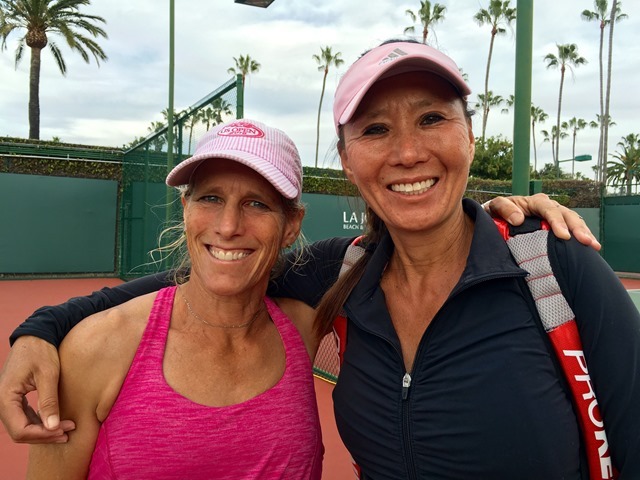 In doubles, Debbie Spence Nasim/Tracie Currie showed no mercy on the #4 seeds Ginger Rogers Phillips/Mercedes Michel, winning 60 60 (the blowout); the comeback was Dawson/Jenny Rens against Debbie Higa/Jami Jones. 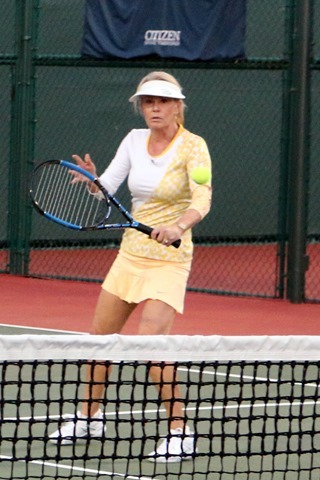 Deb/Jami won the first set 61; the Jennifers rallied to teak the second though 76 and went up 50 in the third. Deb/Jami won two games to make it interesting but Jenny R hit a big return on match point to seal the comeback victory. 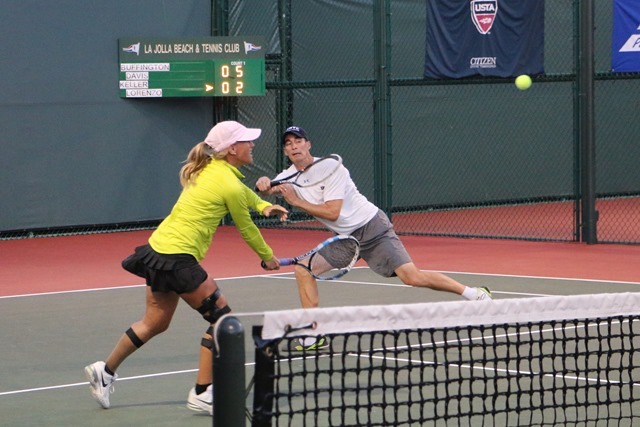 In mixed I only saw one match, Una and Brett Buffington against Conan Lorenzo and Jenny Rens. It was a good match. Brett and Jenny both had their noses over the net and Conan and Una played well too. Una/Brett had a 63 41 ad lead in the second before Jenny and Conan rallied to take the set in a breaker. But Brett and Una pulled out the third set 63. They play the McBrides in the semis. In men’s action, Marcio Carlsson, one of the Brazilian players, continues to impress. He dropped a game today, to Michael Chang and faces the #9 seed, David Smith, who came out of Josh Oswald’s (#2 seed) quarter. 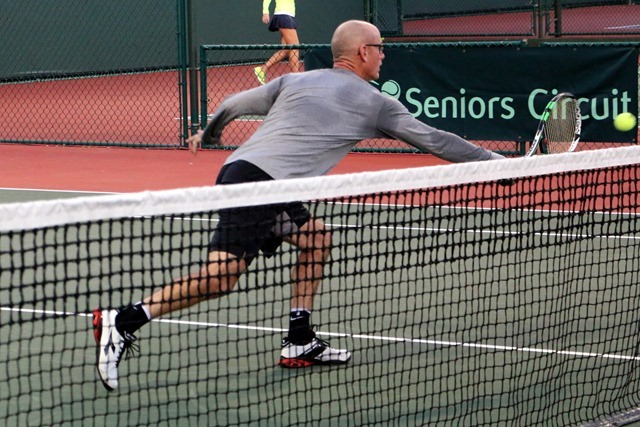 Tony Bujan beat Jeff Greenwald and plays the 2011-12 champion Oren Motevassel in the semis. 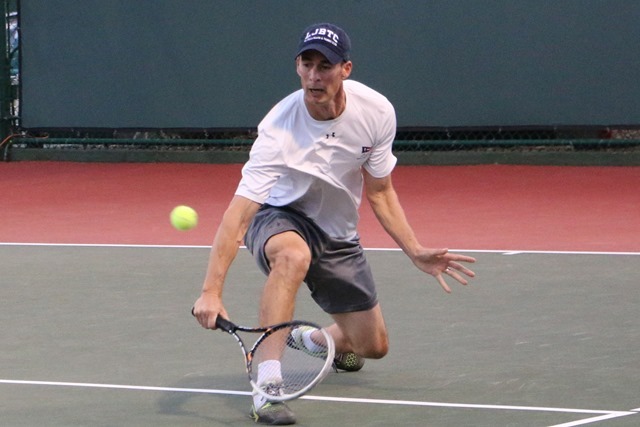 In men’s doubles, top seeded Peter Smith/Neel Grover will take on #5 seeded Willie Quest/Jared Jacobs who edged #2 seeded Leon Bax/Nick Chasseray. Tomorrow the father/son and grandfather/grandson begin. The courts will be packed. Great sunset, and congrats to get to the semis in the youngster’s age group. Must be sheer delight to watch all those exciting matches and report with photos, as well! Christmastime for my singers and silver sneakers is here with parties and performances! Happy Holidays!